We humans generally have an attitude of questioning certain things before we do or consider something. I have seen certain people who question each and everything and there are people who don’t question much until unless there raises a situation. The quality of question matters instead of the number of questions you ask. This actually fits into all the situations humans face in their lifetime; Considering the statement above, it is important for all IT admins, SMBs and MSPs to ask questions based on their actual needs. 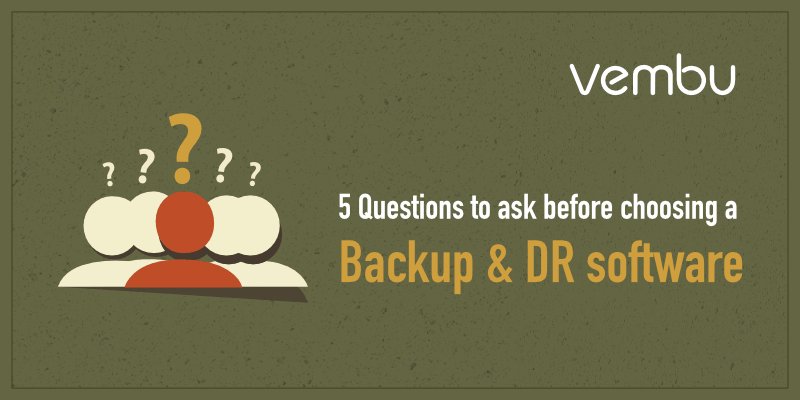 I am writing this blog for all the techies and professionals out there to choose the best backup and disaster recovery solution with just five important questions. There are many vendors who provide Backup and Disaster Recovery in the market but, If any one of the solution, out in the market satisfies all these 5 questions mentioned below then that will actually be the best solution that you can rely on. Determining the quantity and the kind of data you need to back up can help you to narrow down your focus. The data can be of any format, it could be a File/Folder, Application or an image of an entire machine. The data size can be in GBs, TBs or even PB. When performing backups, make sure that the available bandwidth is sufficient to process without any bottlenecks. A business can’t remain static for long, and that includes yours also. Therefore, whatever solution that you have planned to choose, make sure that can also serve your future needs. Never choose a backup solution that serves your backup needs only for now and not on the long run. The better way to start would be listing the type of data, programs, and operating systems that you would need to back-up for now and then another list detailing those that have its possibility in the near future. The main reason that we opt for a backup solution is that we can archive the data and also restore it whenever it is necessary. Thus, the recovery or restore plays an important role to save your business; so it is better to opt for a backup solution that provides multiple recovery options. The reason that I stress on multiple recovery options is that you can have your data restored in any environment and if needed only the required data can be restored through granular recovery which can actually save your time and resources. Support can be of any form. You have good old fashioned technical support, support for backing up applications, support of backing up operating systems, internal and external audit assistance, and assistance with Disaster Recovery, etc…; Pick out what you would need for your resources so you would be able to know what to ask and compare while talking with backup vendors. The most important bottom line. Of course, the answer to this question is more complicated than anyone can assume. You can’t suitably fix on a backup solution for your environment until unless it falls under your budget. As far as pricing is concerned many organizations only consider the quality of the product; so they sacrifice on pricing. Also, If the pricing is cheap then the quality of the product is questioned? thus the pricing part is a bit complicated one. There are some backup solutions that satisfy all the above-mentioned needs, One such Backup and Disaster Recovery solution is Vembu BDR Suite; having survived in the data protection market for more than one and a half decade.